If he was gonna do it, Ed Schultz should have expired July 4. It would have fit his sense of theater. After all, he was a football All-America quarterback and in many ways reflected America itself — high achiever, pugilistic, self-centered, generous, mercurial, brilliant, reckless and fearless. It was one of the few times Ed missed his mark. Then again, maybe he was just being his contrarian self. He didn’t need the Fourth of July. Ed was a walking fireworks display. By now, there have been miles of copy written by former colleagues, competitors, friends and foes. Sometimes they could be one and the same. He was loved. He was reviled. 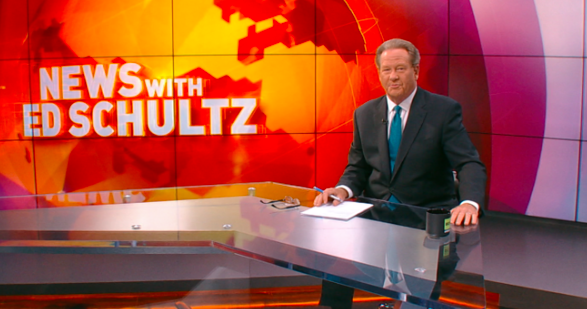 You couldn’t be neutral on Ed Schultz. Switzerland didn’t exist in his world. An introduction to Ed Schultz should have been delivered like a tornado warning. He burned more bridges than William Tecumseh Sherman. He never burned mine, although in his final few years, the bridge didn’t get used at all, mostly because I was disappointed when he went to work for R-T America, lending undeserved credibility to the state-funded Russian news operation. But then, so did Larry King. I didn’t call Ed because if the subject came up, I’d have to tell him what I thought. There’s always been skepticism about Ed’s conversion from a capitalist conservative to capitalist progressive. I never doubted it, and if you’ve met Wendy, his wife, who opened his eyes on their first date at the homeless shelter where she volunteered, you’d get it. Wendy helped Ed discover his better angels. I’ve always thought she was one. Ed enjoyed the irony of being married to a psychiatric nurse. I’m not sure there’s a definitive truth about Ed Schultz. There are only perspectives. One conversation stands out. Ed was talking quietly about the loss of his parents. “Sometimes I feel like an orphan,” he said. Ed roared when I told the story. He and Wendy and I hit it off over beers afterward. Soon, I was guest hosting KFGO’s “News & Views” from a remote studio at the Ashley Tribune. Shortly after he launched his national radio show, he called with literary agent Al Lowman on the line. There was a book deal in the works, but Ed didn’t want to work with some hot shot New York writer. He wanted me, and unless he got me, there would be no deal. They wanted a manuscript in six weeks. Six weeks! I balked, which drove Lowman crazy. What was it with these stubborn prairie dwellers? If I remember right, Wendy finally interceded and I signed on. The way Ed told it was, “I said to Al, ‘You think the best radio talker in the country comes from North Dakota, right? Why can’t the best writer come from North Dakota?’” I’d like to believe this is one time Ed wasn’t exaggerating. When I look back at “Straight Talk From the Heartland,” the first of two books we did together, Ed was prophetic about the direction of the country. He had remarkable political instincts. He’d tell me something I thought was outrageous and impossible, but it would come to pass. I started listening closer. Suddenly the world is a whole lot less interesting. Heart problems, they say. I don’t think so. Such a nice tribute to a guy who was tough to like at times, but made the big time.